"A young teenage werewolf is torn between honouring her family's secret and her love for a man." Before "Twilight" existed, there was "Blood and Chocolate", and teenage girls went crazy for the book by Annette Curtis Klause. When the movie came out, it was to mixed reviews. Fans of the book hated the changes while the not-quite-intended "horror-lite" audience thought it was mediocre. With nothing else on my watchlist, I thought it was about time that I gave "Blood and Chocolate" another try. I'm glad I did because, even though I'm neither the right age or gender to fully appreciate it, I came to realise that Katja von Garnier actually made a very good werewolf movie indeed. As you know, I have a thing for Agnes Brucker. It's called "Percy" and it lives in my underpants. Thus, when I saw a copy of "Blood and Chocolate" in the DVD section of my local pawn shop a few months ago, I just had to have it. It was still sealed and I could tell that it came from Big Lots due to the price sticker still being on it. That reminds me that I haven't been to Big Lots for ages. 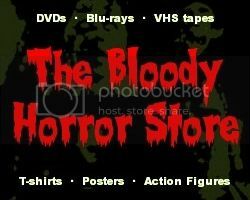 I really need to see if they've got any new $3 horror DVDs. Anyway, for the $2 I paid for it, I ended up with a beautifully shot film which held my interest all the way through. "Blood and Chocolate" certainly changed a few of the more commonly used werewolf tropes and wasn't at all formulaic. Apart from one dirty dog, these loups-garous were more like a peacekeeping force and protectors of Bucharest rather than the more vicious lycanthropes from classic horror movies. As far as star-crossed lovers go, the parkour-loving, chocolate-maker, Vivien (Agnes Bruckner) and the overly pushy, comicbook artist, Aidan (Hugh Dancy), had enough problems even without the werewolf element, but they overcame all that to generate some of the best chemistry that I've ever seen in a screen relationship. Although it may be some kind of heresy in certain circles to suggest such a thing, they were actually a lot more convincing than Bella and Edward, or even Bella and Jacob for that matter. With the bulk of the story being taken up by their romance, there was little time for a lot of werewolf action, but it was nicely done when it did happen. The first chase scene which involved Pete Lee-Wilson as a drug dealer who had fallen foul of the loups-garous' private version of the law was very nicely put together. There were also none of those painful "An American Werewolf in London"-style transformation scenes since the werewolves in "Blood and Chocolate" had a more magical shape-shifting ability which turned them, via only a tiny bit of CGI, into real wolves. I thought that was much better than watching them sprout hair and turn into bad computer game effects. 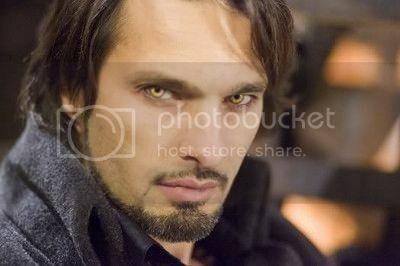 Everyone did a great job, but the standout in the film was, of course, Olivier Martinez as Gabriel. He was very convincing in his slightly menacing role as an over zealous and not entirely unselfish leader. When he turned up riding a motorcycle at one point, I was amused by the '60s pop song reference as he truly was the "Leader of the Pack". I'm glad that the DVD had subtitles though because Agnes Bruckner was a bit mumbly at first, and I found Olivier Martinez's accent to often be quite unintelligible. As an aside, no wonder Olivier Martinez's relationship with Kylie Minogue didn't last as, apart from all the other things which went wrong there, she probably couldn't understand half the things he said either (and vice-versa). Although everything was played straight, there were a few subtle "in-jokes" (for lack of a better term) for werewolf aficionados to pick up on, but I won't spoil any of them for you apart from Aidan's final words which I feel need a little bit of explanation. Because "Blood and Chocolate" was filmed on location in Bucharest, Romania, the "Paris" reference was only a half-nod to "An American Werewolf in Paris" (1997). The replica Arc de Triomphe which they passed through was built in 1922 to honour the bravery of Romanian soldiers who fought in World War I. I know such facts aren't important to the story, but I just thought I'd share that anyway. Apparently, "Blood and Chocolate" was by the producers of the "Underworld" movies, I didn't know that until I looked it up as, fortunately, there were no similarities in style or mythology other than the "Antigen" pharmaceutical which they must have placed in the latest "Underworld: Awakening" to neatly pull "Blood and Chocolate" into the same universe. As "Blood and Chocolate" was an exceedingly slick and entertaining movie which had a lot of originality, I'm going to add it to "The Vault". It wasn't exactly full of horrific and bloody slaughter, but I liked it.